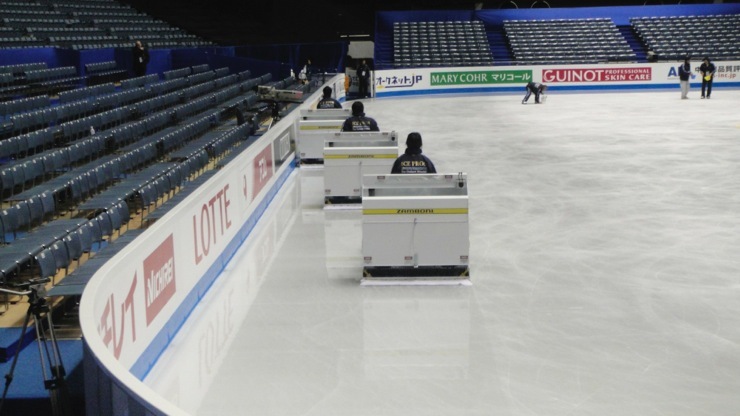 Well, back from the JGP and GP Final in Tokyo – and what an amazing experience. So many things added up to make the entire event memorable. My coach, Mark Mitchell, and I left Boston on Sunday, November 29th, to cross the North Pole (like S. Claus), en route to Tokyo. As my parents had departed the previous day, a big thank you to Mama Gibbons for the early morning ride to Logan! I slept well on the flight over and was wide awake for the drive from Narita Airport to Tokyo. My first impression of Tokyo was that it makes Boston look small. The metro area has 33 million people, give or take a few, and the city proper counts 12 million residents. That said, it is a true testimonial to the Japanese culture and people that everything operates as efficiently as it does. Perhaps because everyone respects the rules and the underlying social contract, it all works. Just one little observation highlights the politeness of these people – I only heard one horn the entire week I was there, and it was a life and death avoidance. Alex Shibutani and I were roommates again, and thankfully (unlike Croatia) we had separated beds! Shibu didn’t arrive until two days later, so I crashed Monday night and slept straight through until Tuesday. After connecting with my teammates and parents, I did a quick sightseeing trip to the Ginza shopping area (the Sony store was AWESOME!) on the subway, then on to evening practice. The arena was comfortable – the ice, however, made a hollow noise when you landed, because it was built on top of a swimming pool. Yoyogi Stadium was the swimming venue for the 1964 Olympics and is set in a beautiful outdoor park near the Harajuku and Shibuya areas of Tokyo – trendy, vibrant, upscale shopping districts. Tuesday night we had our team dinner in an Italian restaurant near our hotel, the Akasaka Prince, which was a lot of fun. I enjoyed meeting some of my teammates for the first time, like Kiri Baga, and reconnecting with other friends I hadn’t seen for awhile, like Grant and Ricky. Practices on Tuesday and Wednesday went well, and I felt ready to compete. We had the opening ceremony on Wednesday night. The short on Thursday went well, and I was just a little behind 1st place going into long. It was so incredible for me to skate to nearly filled arenas – wish we could bring some of those fans back home to the United States with us! It really gives the skaters a boost to feel the fans appreciate our efforts. Friday’s practice was very early (630am or 700am) as we had competed late on Thursday. I think we all tried to get in a nap after practice Friday before the competition at 3pm. Again, we had an appreciative crowd to perform for. My warm-up went well, and I felt ready to compete the long, although I think I was a little nervous. In the end, because I did not do one combination, I felt I performed the long better in Croatia. Still, I did manage to get plus GOE’s on most major elements, which was encouraging, and Mark was happy. When the dust cleared, I ended up in third overall, which was thrilling.